Cottonwoods (Populus spp.) grow to be tall, spreading trees that make great shade trees if you have a large space. Cottonwoods are deciduous trees, shedding their leaves and becoming dormant in winter. You can choose from a few types of cottonwoods that grow well in a home landscape based on the cottonwood facts that show slight differences in the species. Cottonwood trees are native to various parts of North America. For example, the Fremont cottonwood (Populus fremontii) is native to the southwestern United States but also is hardy in other areas within U.S. Department of Agriculture plant hardiness zones 3 through 9. The narrowleaf cottonwood (Populus angustifolia) is hardy in USDA zones 6 through 9 and is a native of California and Mexico while the eastern cottonwood (Populus deltoides) is native to eastern North America, as far south as northern Florida and west to Montana. Its range is USDA zones 3 through 9. Most cottonwoods grow about 65 feet tall, but some species can grow even taller. For example, the black cottonwood (Populus trichocarpa) can grow to be 100 feet tall. It's hardy in USDA zones 5 through 9. 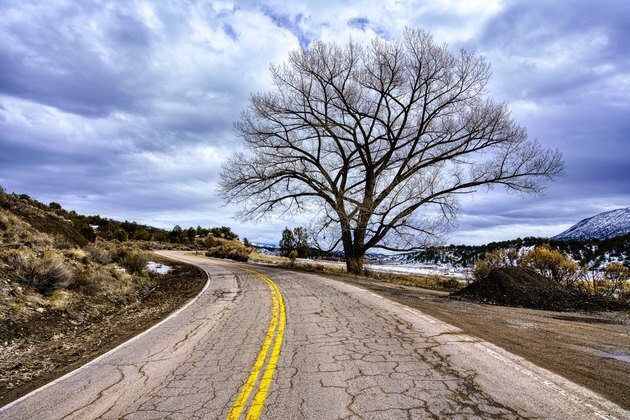 Cottonwoods are fast-growing trees, adding about 3 feet to their height each year. The black cottonwood tree may grow a bit slower. Cottonwoods have a gently spreading shape, with a canopy width that ranges from 25 feet for the black cottonwood to about 50 feet for the Fremont cottonwood. They're also long-lived trees, with an average lifespan of at least 40 or 50 years. Some species, such as the Fremont and narrowleaf cottonwoods, live up to 150 years. The lanceleaf cottonwood (Populus acuminata), hardy in USDA zones 6 through 9, is an exception, usually living fewer than 50 years. The cottonwood plant usually has oval, light- to medium-green leaves. The leaves on the black cottonwood are a dark, rich green and fragrant. Leaves on all varieties tend to turn yellow when fall arrives. The trees are dioecious, which means each tree is either male or female. Both sexes have flowers, which are usually inconspicuous, although the eastern cottonwood has drooping clusters of yellow-red flowers in spring before its leaves appear. Both sexes produce pollen that can cause a reaction in people who are allergic to it, and a female cottonwood grown in the vicinity of a male cottonwood of the same species produces seeds with cottony tufts in summer. The tufts can be messy, littering the ground under the female tree. If the litter is a concern, then plant only a male cottonwood. You can find a young cottonwood's gender on its garden center label, or ask the center's staff. Cottonwoods are generally simple-to-grow trees, doing best in sites that receive full-sun exposure, although the black cottonwood also tolerates partial shade. Cottonwoods are well-adapted to moist or even wet soil, with the exception of the Fremont and lanceleaf varieties, which tolerate some dryness, and the Rio Grande cottonwood (Populus deltoides subspecies wislizenii). The Rio Grande species is native to hot areas with dry soil but also tolerates some moisture if its soil is well-drained. It's hardy in USDA zones 7b through 10. Cottonwood branches tend to be weak, so the trees aren't suitable for windy spots. They also have aggressively growing roots; don't plant one near a sewer system, building foundation, paved area or other site where its roots may cause problems. The trees are susceptible to several fungal problems. Prevent them by siting cottonwoods where air circulation is adequate and soil doesn't stay waterlogged after rain. Cottonwoods may attract aphids, which are tiny, soft-bodied, greenish-white insects. Insecticidal soap diluted at a rate of 5 tablespoons per 1 gallon of water can help destroy the insects. Spray the affected trees until all their surfaces are dripping wet with insecticidal soap. Spray on a sunny day so drying occurs rapidly, and ensure the air temperature is below 90 degrees Fahrenheit and drought is not present. Repeat the application at seven- to 10-day intervals as needed. When handling, mixing and applying insecticidal soap, wear goggles, a hat and clothing that covers your skin, and avoid inhaling the spray or fumes.